There's a new, compelling video in town that provides tremendous insight into today’s human service environments, and the specific ways we need to be including dads in family services. It's titled "Dad's Rock!" and is brought to us by The Children's Bureau featuring The Children’s Trust of Massachusetts and People, Incorporated located in Fall River, MA. Research indicates children have increased positive outcomes when dads are involved, and yet all too often, agencies struggle to attract fathers to their services, and fathers face unconscious bias that keeps them at arms' length. The professionals in the video share that men do in fact want to be good dads, but they need groups and encouragement to help them through difficult times rather than being excluded. 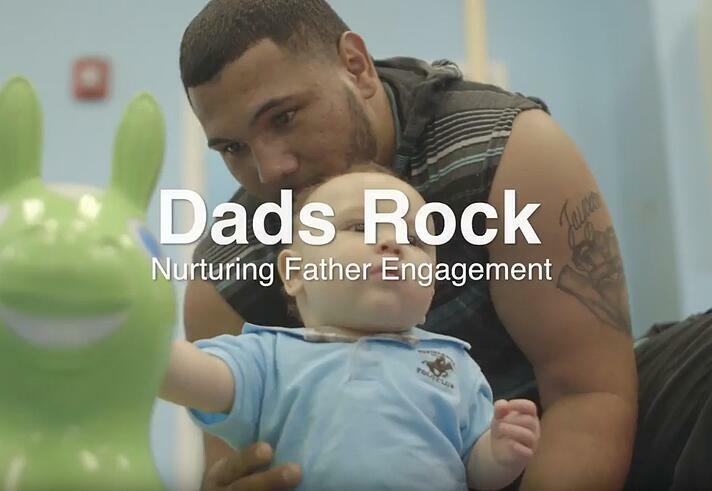 Watch this video and hear what these practitioners have to say in "Dad's Rock! Nurturing Father Engagement." Haji Shearer, Director of the Fatherhood Initiative of the Children’s Trust begins with wise words, ”When we help one individual dad get more connected with his family we’re changing that whole community - we need to start recruiting dads with the same passion that we recruit moms because dads are super important to kids' lives as well. Haji hit the nail on the head. We need to stop talking about engaging dads and instead, start doing it. Haji continues that if we take on the perspective that dads can learn to be nurturing and selfless and care about the bigger picture, we can begin helping them talk about what’s going on in their lives, and guide them in being the best father they can be. He explains that when he started to do this kind of work, it wasn’t uncommon to get a referral from an agency for social services and they’d say don’t bother working with dad, just work with mom and the kids, dad isn't involved with the family. If we were denying any other cultural group the same access to services, it would be a huge travesty! Suzin closes with a "call to arms" for everyone serving families: "Get the research, read it, share it with your staff, in a meeting talk about the implications of what we just read... Do you hire men? Do you listen and have focus groups to discuss how they experience your program? I implore you, in line with the wise words in the video, to shift a little bit of your time and attention from mom and invest it with dads, because the dividends will be great. A big thank you to the Child Welfare Information Gateway, an information and referral service of the Children’s Bureau, U.S. Department of Health and Human Services for the use of their Building Community, Building Hope content and video.